Propagandist and openly admiring account of Germany’s 1914 campaign in Belgium and France written by a famed Swedish explorer. Sven Hedin denies clear evidence of German atrocities, and berates Britain for joining the war. An interesting, if deeply flawed, corrective to Allied war propaganda, and a rare view from the other side of the hill. The conduct of the German forces in their attack on Belgium that brought Britain into the Great War has long been controversial. Bestial atrocities – including the mass shooting of civilians and wanton vandalism – were played up in Allied propaganda – and subsequently widely disbelieved, only to be confirmed by modern scholars. 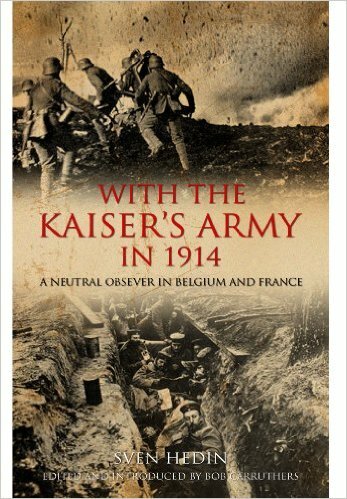 This book is something of a rarity – and caused a furore when it was first published – as it is a propagandist work written from the German side and published in English in 1915 shortly after the events it describes, while the war was raging and hatred for Germany was at its height. Its author, the celebrated Swedish explorer and mountaineer Dr Sven Hedin, although officially a neutral, was an unashamed admirer of Germany given privileged access to interview German soldiers and Allied prisoners. He denies that his beloved Germans committed cruel atrocities, and his preface berates Britain for entering the war and restates his faith in German victory. In an apologetic note, Hedin’s English publisher, John Lane, says his purpose is to ‘rouse the British Lion by tweaking its tail’, pointing out that Hedin’s account of the 1914 campaign gives a true picture of the efficiency of the German military – which Lane calls ‘the wonderful organisation against which we are fighting’. Plentifully illustrated with photos, drawings and maps, this eyewitness account of the campaign that set the course of the war, despite its admitted bias, is a must for all Great War buffs – and for students of wartime propaganda. Hedin went on to write other similar pro-German books in both world wars, and became an avid admirer of Hitler and the Third Reich.